And here we go with the final start to Bendis’ Superman comics. It’s one of the stronger efforts so far. If Action Comics focuses more on character and grounded based stuff, vs. Superman tackling Rogol Zaar and the weird space stuff, I know which one I’ll be sticking with. Clark Kent finds out that a little boy told Deputy Fire Chief Melody Moore that Superman started the fires, so he visits her as Superman to get to the bottom of this. Moore is hesitant to speak, since Superman is now a suspect in the arsons, but she eventually comes clean. Superman tracks down the boy — with a hilarious bit about talking to his mother first — and the kid admits that some bald stranger paid him $300 to tell the authorities that Superman started the fires. That bald stranger is a member of a group of non-costumed villain types, who meet in a lead-lined tank to discuss criminal stuff away from prying alien eyes and ears. Their apparent leader, Mr. Stone, is upset that the guy is starting fires and is even more upset that the guy would try to turn it on Superman, since nobody is going to believe Superman started the fires. Then a secret powered member, Red Cloud, shows up and kills the bald stranger for his insolence. Meanwhile, the Daily Planet’s gossip columnist is super eager to find out where Lois Lane has gone. She thinks Lois has left Clark Kent for Superman. So, uh, did Lois and Clark not figure out a cover story for Lois going into space? Did they really not even bother with a phone call, “Hey Perry, it’s me Lois, I know this is short notice, but I’m going on an extended sabbatical. Be back soon.” Wouldn’t that have simply solved everything? Then nobody would care why Lois Lane had mysteriously disappeared and her husband was still around. Just sayin’. Other than that, this was a really fun issue of Bendis’ Superman saga. I have been pretty vocal of the fact that I don’t care for this Rogol Zaar character and whatever boring storyline Bendis has cooked up for him. I am far more interested in this arson mystery, and Bendis really dives deep into that with this issue. The story stays grounded in Metropolis, with Superman interacting with normal people, and it’s great! The bit where Superman found the boy’s mother first, and what kind of punishment she’d like to see for her son for lying, is hilarious. Leave the mothers out of this, alright? That is where Bendis’ Superman comics shine, especially this issue. Just watching Superman interact with members of the public is pretty darn cool. It helps that Gleason, an old hand at the character, makes Superman look phenomenally heroic and impressive, but at the same time, human. 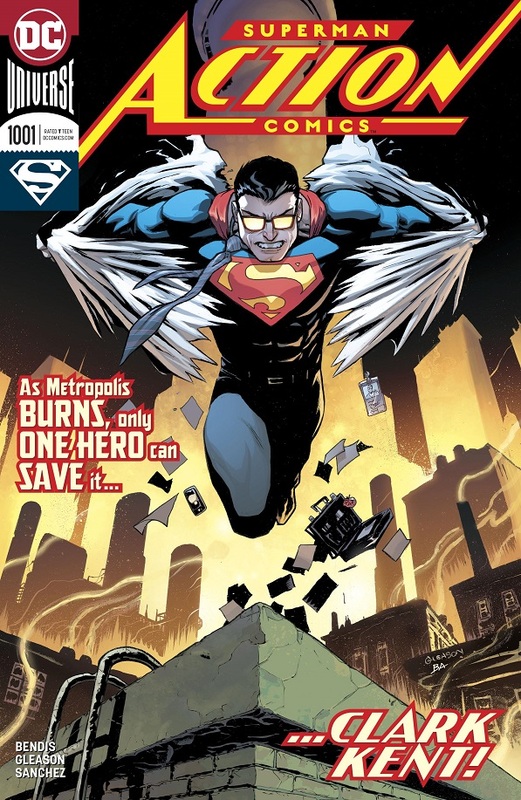 One gets a real sense of Superman’s impact on the Metropolis community in this issue, and I really liked that. It really sells the issue and hopefully the series going forward. The new villains aren’t all that interesting yet, but we’ll see what happens. I’ve definitely got more of an open mind following this strong issue. 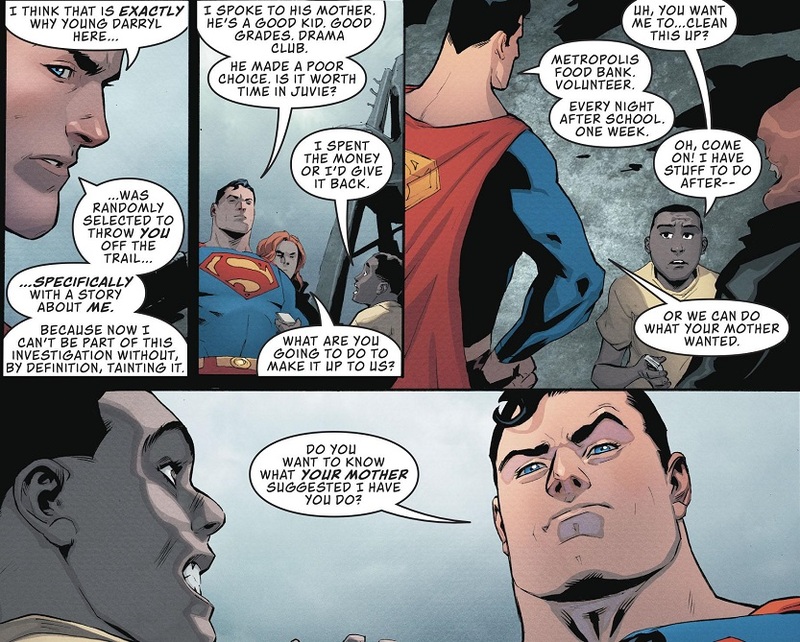 TL;DR: When Bendis focuses on a grounded Superman, among the people, his stories really soar. Things are pretty great for Spider-Man, who is in just the best of moods as he fights Man Mountain Marko and the Ringer during a robbery. He’s in such a great mood because he’s back together with Mary Jane Watson! But he’s also dealing with the fact that the Lizard is now a college professor. Peter freaks out, but Curt explains that he’s wearing an inhibitor chip nowadays to control his Lizard form. He introduces Peter to his advanced learning class, which is working with the Isotope Genome Accelerator, the device that gave Peter his powers to begin with back in Amazing Fantasy #15. Then Taskmaster and Black Ant break-in to steal the device. 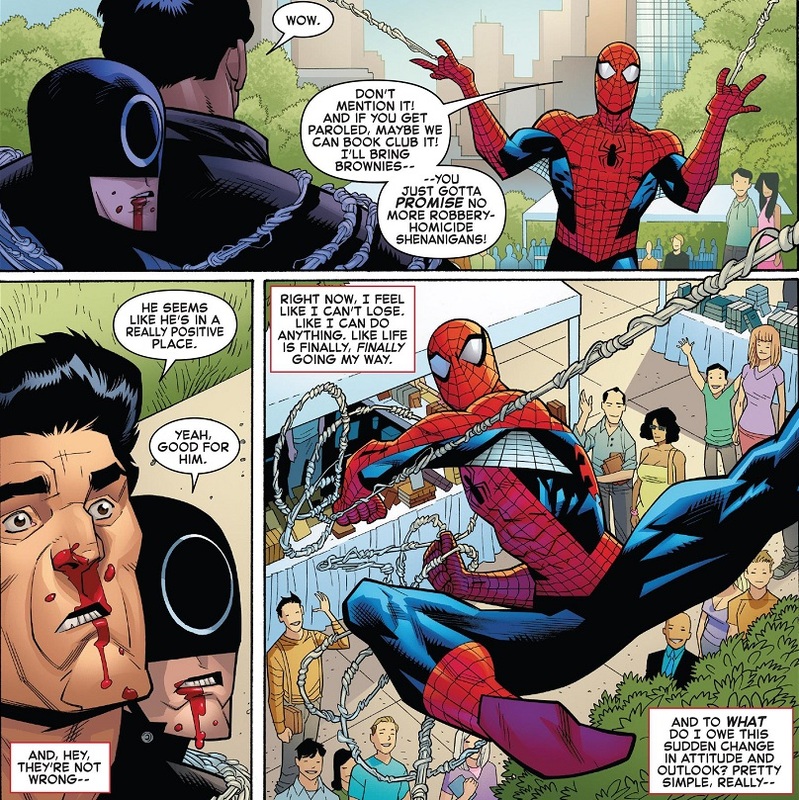 Peter causes a distraction with a big chemical cloud reaction, allowing Spider-Man a chance to show up to beat up the bad guys. When it’s over, Spider-Man then helps Peter Parker to his feet! What what WHAT?! There are some nice bits and pieces in this issue, because Spencer is a strong writer, but on the whole, it’s nothing special. There’s a weird timeline switch in this issue that is a little confusing, because it’s not made obvious that there’s a timeline switch. 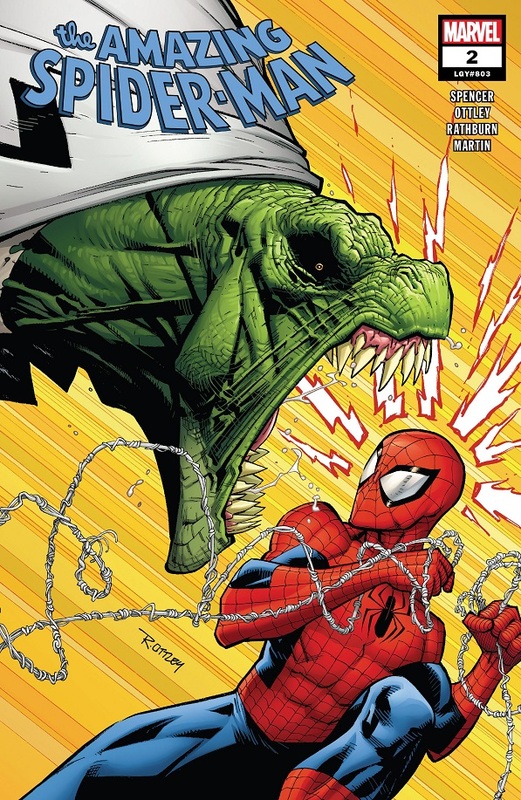 You see, the opening scenes with Marko, Ringer and Mary Jane clearly take place after the scene with the Lizard, Taskmaster and Black Ant, because Mary Jane mentions that Peter has to get to class…but then the Lizard scene picks up from the previous issue, when Peter was first introduced to the idea of having to go to class under the Lizard. And yet, how do we line up Peter and Mary Jane so casually together when we get that weird cliffhanger of two Peters/Spideys? Or it’s possible that Mary Jane misspoke when she said Peter had to get to class, and instead meant he had to go to ESU to sort out that plagiarism mess…I dunno. Suffice to say, it’s a weird little complication that throws the comic a bit off its tracks. Hopefully that’s the sort of thing that will smooth out as we go along. Spencer’s handling of Peter Parker is pretty solid. He’s friendly, kinda funny and Spencer writes his Spidey scenes well. The opening scene with the two crappy villains was fun. And I’ve always liked the Lizard as a supporting character, so that will hopefully be a cool addition to the cast. The Lizard as college professor should be a hoot. Taskmaster and Black Ant as random villains don’t account for much. Their appearance also stretches credibility, in that, these two professional bad guys really thought the best time to steal this science device was in the middle of a crowded classroom, with the Lizard watching over it? They couldn’t have waited until the school was closed for the night and everybody went home? Then there’s the idea that Peter can simply change into Spider-Man due to some chemical smoke in the middle of the classroom, and nobody is going to question how Spider-Man can suddenly show up in the middle of everybody. It’s just, I dunno, a bit of a stretch for everything to happen as it happens, without a strong enough story/funny enough banter to smooth over these rough edges. TL;DR: Spencer’s Amazing Spider-Man goes through the Spidey motions to tell a pretty standard Spidey story in this issue. Surprise cliffhanger could be a little interesting. Here we have incontrovertible proof that Kelly Thompson should become the next head writer for the X-Men franchise. 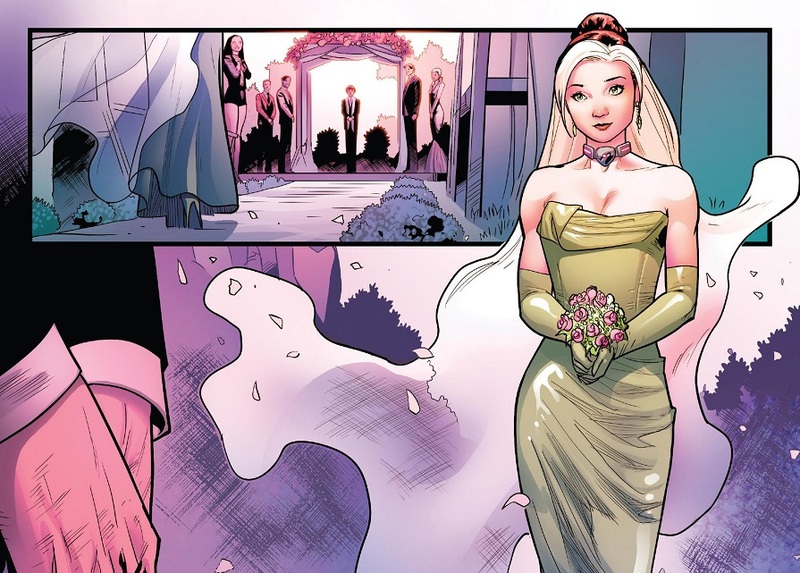 When Kitty Pryde balked at marrying Colossus, Gambit stepped up and asked Rogue to marry him on the spot, to make use of the wedding decorations and stuff that were already in place. This issue picks up during rush preparations as the various X-Men split off to help the new bride and groom. Even Mystique shows up to show her support for her daughter. 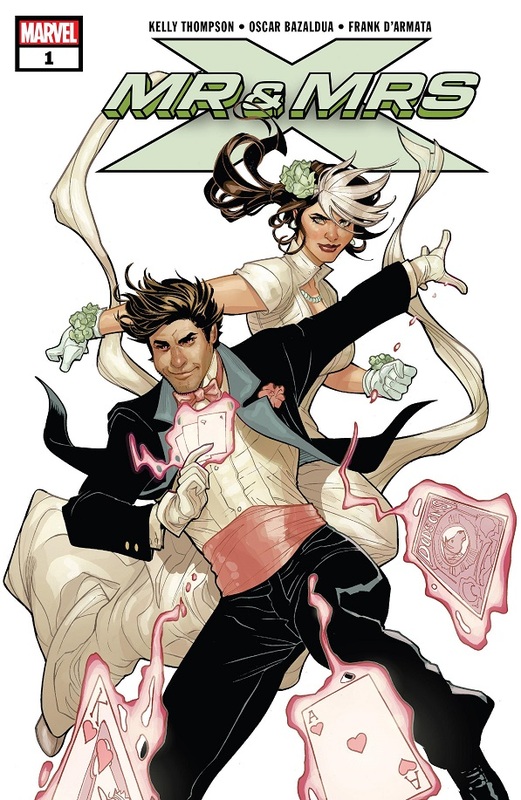 The wedding goes well and Gambit takes Rogue into space for their honeymoon. Which means they’re the closest when the X-Men are called to intercept a package in space, which has already been grabbed by some of the Shi’ar Imperial Guard. Rogue and Gambit get into a fight with the Guard, until Rogue grabs the package and accidentally phases through the hull of the spaceship and out into space. She is teleported away before Gambit and the Guard can rescue her, and it turns out she was snatched by Deadpool! This issue is pretty much the most fun I’ve had with the X-Men in a group in a very long time. Thompson writing everybody coming together to put on a spur-of-the-moment wedding is super fun. They joke amongst themselves, everybody gets to react in a fun and realistic way, and they all really come together nicely to pull off a lovely ceremony for two longtime members. 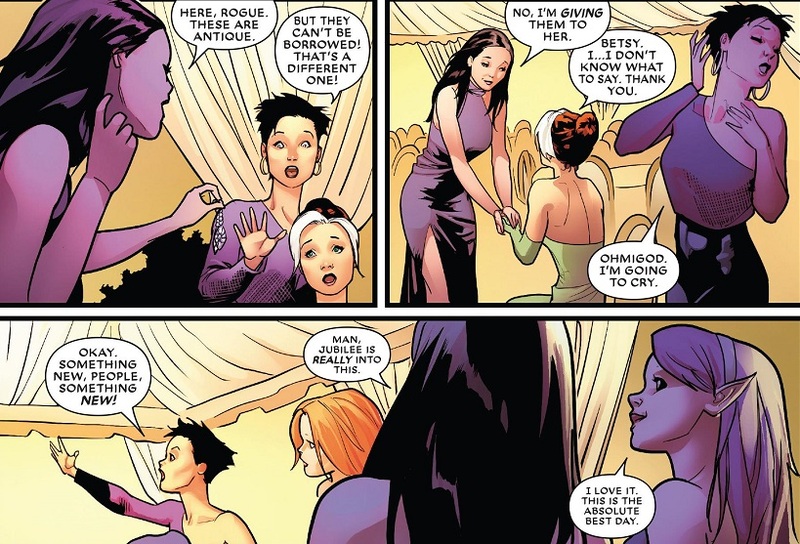 The camaraderie and family aspect of the X-Men shines in this issue, making the whole thing just darling. Thompson does a great job with the more focused, personal stuff, too. Rogue and Gambit themselves are great, their characters shining through as they have a lovely time, then get into a fight. 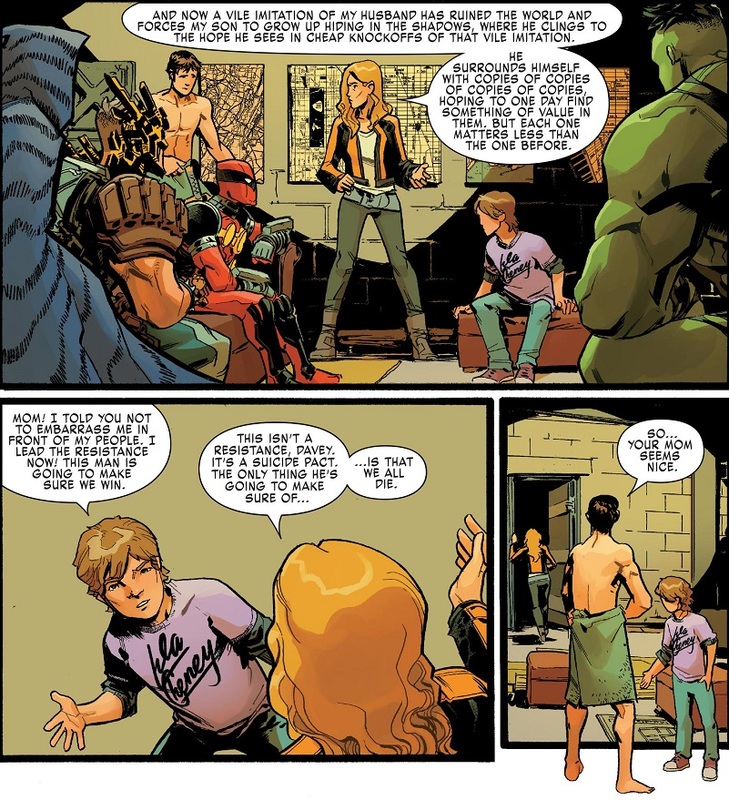 Thompson’s jokes and banter are a hoot and a half, getting me very excited for her upcoming West Coast Avengers comic. But I really do think she should be given one of those X-Men titles. Maybe Marvel will put her in charge of their return to Uncanny X-Men. That would be something special! I also really like the art in this issue. I’m not sure if I’ve ever seen Bazaldua before, but his style is really cute, but also really detailed. Everybody looks like people, with really cute faces — Though some of the female faces do look a little too similar when side-by-side. TL;DR: Despite a really bad name, the new Mr. & Mrs. X series gets off to a really enjoyable start! Thompson works wonders with the X-Men. The new Multiple Man comic just gets weirder and weirder, and I don’t particularly like it. The Super-Powered Madrox Squad takes Jamie back with them to the future, where he eventually becomes a dictator who rules the world with an iron fist. But he’s trying to prevent that. They run afoul of some Madrox soldiers and eventually follow a kid down to the secret sewer HQ of The Resistance, which is led by the son of Jamie Prime and Layla Miller, and who use good personality dupes as their fighters. Layla insists this Resistance nonsense is going to get everybody killed. We also find out that our protagonist dupe was created even before Jamie Prime married Layla, so he’s never met her before (though she doesn’t know that this guy is the future dictator). Jamie also meets future Forge, whom he entrusts with building more time travel devices so that he can send some dupes into the further future to create the Super-Powered Madrox Squad to bring him from the past to the future. It gets purposefully complicated. And later, when more security forces arrive and everybody gets into a big fight, they managed to kill Hulk Madrox, which puts them all into retreat. Eh, I’m not feeling it. This is a very plot driven comic, and the plot just gets weirder and weirder. I’m doing my best to keep track of the various time travel shenanigans, but Rosenberg isn’t making it easy. The appeal of Jamie Madrox has always been his strong and grounded characterization. But this series is really pushing the weirdness, while keeping the Madrox Protagonist just slightly removed. He doesn’t seem to really grasp what’s going on, and is just along for the ride, no matter what weird thing or person they encounter. This characterization adds an extra level of removal for the audience, so that we’re not so much experiencing the story as we are just sitting back and watching a bunch of crazy plot unfold. It also doesn’t help that we’re not following Madrox Prime, and instead just a dupe that doesn’t really know anything about Madrox’s recent past. I don’t know about you, but I’ve just never liked the idea that a dupe could simply take over for Madrox Prime and everything would be back to normal. MooOOOooom! Not in front of the Resistance! Part of me feels like I might enjoy this comic more if it didn’t star — and waste — my all-time favorite comic book character. On the surface, the weirdness is kind of fun. Rosenberg is throwing out all manner of neat and crazy ideas, and there’s some enjoyment to be had just going along for the ride. But for me, personally, I would have liked something more character-focused for Multiple Man. 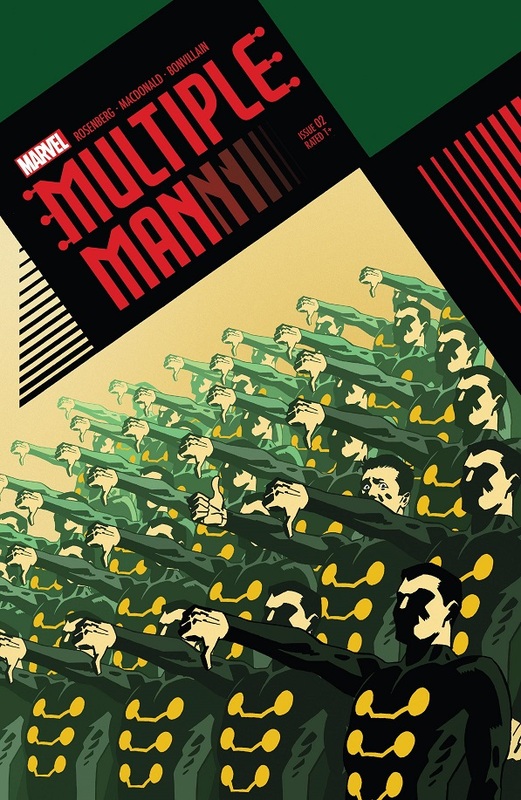 I just have to accept that different creators are going to have different ideas, and I should just be happy that there’s a Multiple Man comic at all. TL;DR: The plot gets out of control and really takes over in the Multiple Man mini-series, leaving readers somewhat detached. 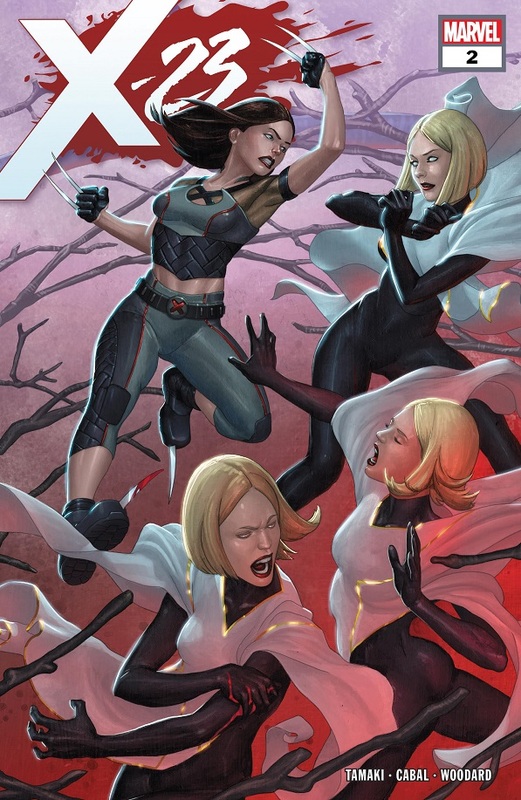 Unlike Multiple Man, X-23 keeps the focus squarely on the characters, making for a far more enjoyable comic. One of the resurrected Cuckoo clones has died after the other resurrected clone injected her with something last issue. The regular Cuckoos are reeling from this, with some possible dissension in the ranks. Meanwhile, Laura investigates the missing scientist and tracks her down to the church where the Cuckoos were holding her. Gabby shows up claiming Laura texted her, but it was a trap by the Cuckoos! They distract Laura with a psychic attack and kidnap Gabby! Also, Gabby continues to spend the issue complaining about wanting a birthday! While not as much fun as the first issue in terms of sheer overall hoorayness, the second issue of X-23 is still an enjoyable outing with entertaining characters and an interesting enough storyline. That the Cuckoos already have dissension in the ranks is great for them as characters, since it’s nice that they’re not all super evil all of a sudden. I love their new redesign because Cabal makes them look so freaky and cool. They also make a great choice for villains, since they’re very close to Laura, making this far more personal than if it were some other random X-villain thrown into the story. The characters involved are really driving the story, and it’s an interesting story to boot. But the main focus, of course, remains on Laura and Gabby, and Tamaki is doing a wonderful job with the two of them! Tom Taylor should start shaking in his boots at how well Tamaki writes Gabby. I wonder if he gets jealous seeing his pet character doing so well under another writer. Hopefully he, like me, is just so pleased that Gabby remains a strong and entertaining member of Laura’s supporting cast. The two are a great team, and I think Tamaki is also doing a lot to flesh out Laura’s character. And again, the art is just phenomenal! This is a well-built comic. Though we still don’t know why Laura switched back to the name ‘X-23’. TL;DR: Art, storytelling and character development come together nicely for a really enjoyable comic with a strong pair of leads. Posted on July 28, 2018, in Comics, DC, Marvel, Multiple Man, Reviews, Spider-Man, Superman, X-Men and tagged Action Comics, Amazing Spider-Man, Gabby, Gambit, Honey Badger, Jamie Madrox, Mr. & Mrs. X, Rogue, X-23. Bookmark the permalink. 9 Comments. Mr. and Mrs. X #1 is comic of the year so far for me. Loved it so much. I adored seeing Rogue so happy at last. Thompson is the writer we’ve been needing. I can’t give Multiple Man a 6. I’m really frustrated that Marvel writers are putting him, Quicksilver, and The Exiles in weird worlds just to show how weird their stories can be. That’s not what I want to see, and I’m not sure anyone does. I think it’s lazy, and it wastes my time. I’m not really understanding X-23 so far, and your review is making me think maybe it’s just because I don’t know much about the Cuckoos. Glad you’re liking it. Is that what happened in the Quicksilver comic? I considered picking it up, but now I’m glad I didn’t. I get that it’s fun to be creative and weird, but character-based stuff is always better reading. What’s not to understand about X-23? I’ll admit that the Cuckoos’ plot is a little weird to wrap my head around, but I’m understanding it well enough. And the focus on Laura and Gabby is what really sells me on the book. Quick explanation: The Cuckoos used to be five identical telepathic girls, who all spoke as one in a really creepy fashion. That was their gimmick. They were the Five-in-One. And they were students at the X-School. Later it was revealed that they were all clones of Emma Frost. After that, one of the girls decided to turn evil and join the Brotherhood, but she was killed. And then another sister was killed. So for the longest time, it’s just been the Three-in-One instead, hanging on the fringes of the X-Men. This new story is about the Three-in-One re-cloning their dead sisters, but it seems the evil one is still evil and is working against them. That helps, thanks. I just can’t imagine what they want with Laura and Gabby. So I don’t understand their motivations. And I wasn’t sure what was happening toward the end of #2. Quicksilver is stuck outside of time. So he’s still on Earth, but most of the time he can’t interact with anyone. So it’s effectively a “different world” story. It’s frustratingly boring to me, because the mystery of what he’s been seeing and fighting just goes on and on, and I don’t find it interesting enough to last an entire miniseries. Do you mean when the pages went red? The Cuckoos are telepathic, so that was a wild psychic attack to distract Laura, and she eventually figured out it wasn’t real and she cleared her minds. As for what they want with Laura and Gabby, we don’t know yet. Ok! Thanks very much for that. It’s really cool to have a community of people to be able to discuss these things with. And this is one of my favorite places to do that. Thanks for all you’re doing. Mr. and Mrs. X is really good. So fun, so charming. The wedding’s really nice, and the plot has me interested. I love pretty much everything Kelly Thompson writes. Multiple Man is fine, it’s funny, it’s well-plotted. But it also has this weird sense of disconnect. That removal you mention. It makes it that much harder to actually connect with the story or the characters. I’m glad to hear I’m not the only one who can feel that disconnect with Multiple Man. Though I am fully aware that I probably dislike it just a little bit extra because of its use of my personal favorite character. I am not immune to that sort of fan opinion. Nah, I get what the book’s going for. PAD’s X-Factor often did much the same thing, the casual banter around insane events, with some characters having very detached attitudes about everything. But X-Factor was an ensemble cast, meaning other characters could be more emotionally invested. There could be sincerity to the book. So far, Multiple Man’s been pretty lacking in any sense of sincerity.